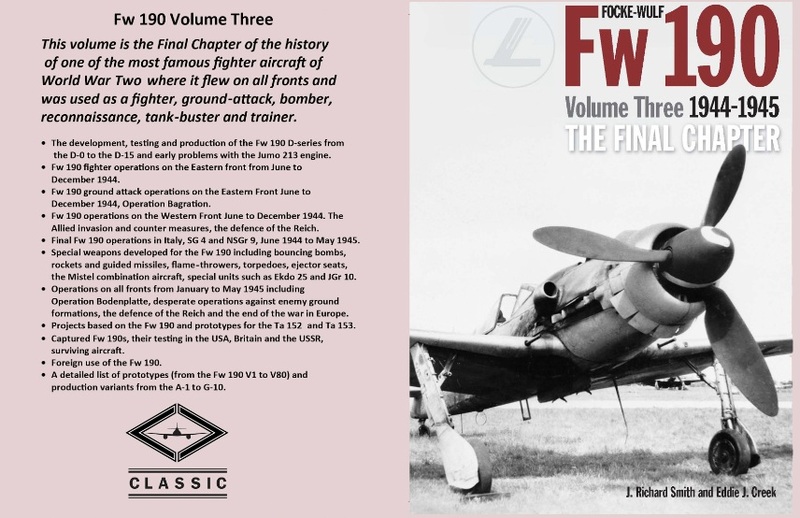 With Volume II of his Focke Wulf Fw 190 series published and the exceptional Stuka book having been out for a while now, it seemed like a good time to call up Eddie Creek (second from right, Chevron Publishing team photo) and offer him congratulations on an extremely productive 2012..
" Eddie, you have obviously been extremely busy in 2012. How is the writing and research progressing ? " 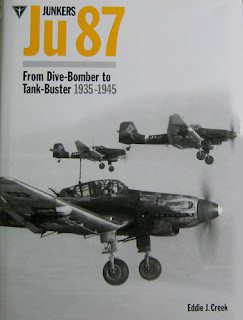 yes, thanks for your comments on the Ju 87 book . In the end it was a nightmare to produce! I understand that the Fw 190 Volume 2 is now also out although I have not received any copies as yet. I am currently hard at work on the Fw 190 Volume three. Here's a first look at the proposed cover ! (below) There is no doubt that these books have been a huge effort to produce and Richard Smith and I have been researching this aircraft for around 40 years now.
" ..Thank you Eddie ..Do you perhaps have a minute to tell Luftwaffe blog readers a little about yourself as writer, technical artist and historian. Have you always been interested in aviation?" My interest in aviation history goes back as far as I can remember, although it was originally mainly WW1. I started to build models but very soon my mother started to complain about all 'this rubbish' and I also ran out of space to put them. This led me in to start collecting aviation books and magazines and at the age of 11 I started technical drawing lessons at school. This was lucky for me, as I then found something I really enjoyed doing and began to produce line drawings of aircraft to 1/72nd scale. 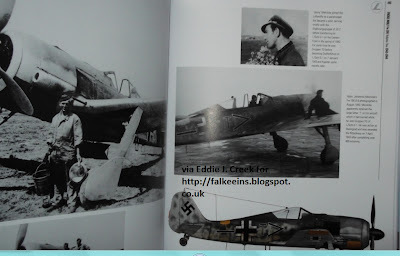 "..When did you start researching and writing about the Luftwaffe and what prompted your interest in the Luftwaffe.."
Due to the apparent difficulty of obtaining original material on WW1 aircraft I gradually became more interested in WW2 and began to buy books written by William Green and noticed that much of the illustration was being done by Gert Heumann and Peter Endsleigh Castle. Then in 1958 I bought a copy of RAF Flying Review and in the centre spread there were around 30 side view line drawings of German WW2 aircraft. It was the first time I saw a Do 335, Me 163 and an Me 262 etc. etc. and from that time on I began my research in to the WW2 Luftwaffe. A few years later in 1963 I had a huge stroke of luck which allowed me access to the Ministry of Aviation, Technical Information Library which contained a lot of original captured material confiscated from German aircraft companies at the end of WW2. At this time there were no Xerox copying machines and the only way to copy any material was by 35mm camera using film. This in turn meant I had to take up photography and learn to develop and print the material I was able to copy using my bedroom as a dark room. Also as no computers were yet available all correspondence had to be carried out by writing using a typewriter and in this way I contacted Gert Heumann who was then the editor of Flug Revue magazine in Germany. This led to us meeting up and he gave me my first airbrush and taught me the rudiments of colour profile scale drawings. Unfortunately Gert died a long time ago but then Hans Redemann took over as Editor of the magazine and we became good friends and exchanged a lot of material which at that time was still quite scarce. You are perhaps first and foremost associated with Putnam's 'German Aircraft of the Second World War' (pre-Classic of course..) How was the workload shared on that book with your fellow authors/researchers. How long were you working on this book? How did you meet J. Richard Smith? It was the death of Gert Heumann that led to me to becoming involved in the Putnam book 'German Aircraft of the Second World War' as I was already helping out with this. I had also had some dealings with William Green but this was at a much lower level than those I had in Germany. William Green's book 'Warplanes of the Third Reich' was also a landmark but I decided that the Putnam book should cover a wider range of aircraft and include some of the more experimental aircraft and prototypes that never made it in to service. Luckily in 1963 I became a member of Air Britain and joined the 'German Aviation Research Group' within that organisation, which is how I met Richard Smith and Anthony Kay. However the Air Britain magazine seemed to concentrate more on publishing lists of civil aircraft codes than what the Group was interested in. So after a while we decided to form our own dedicated research group which led to the formation of Gruppe 66 and we published our own magazine called 'Archiv'. We anticipated having a world wide membership of around 100 but this figure was soon exceeded and within a year we had a membership of nearly 1000. Unfortunately producing the magazine for this number of people soon became a full time job and gradually after three years and other more pressing developments in many peoples lives the whole thing came to a halt. However Richard Smith and I had become good friends and carried on our correspondence which led to me suggesting doing the Putnam book after Gert Heumann's death. Although I am credited with just the drawings for this book, this is simply not the case as we did the research and co-operation together. However I was the only one who could draw and yes I did do all the drawings but the whole book was a three way effort with the royalties being shared equally. 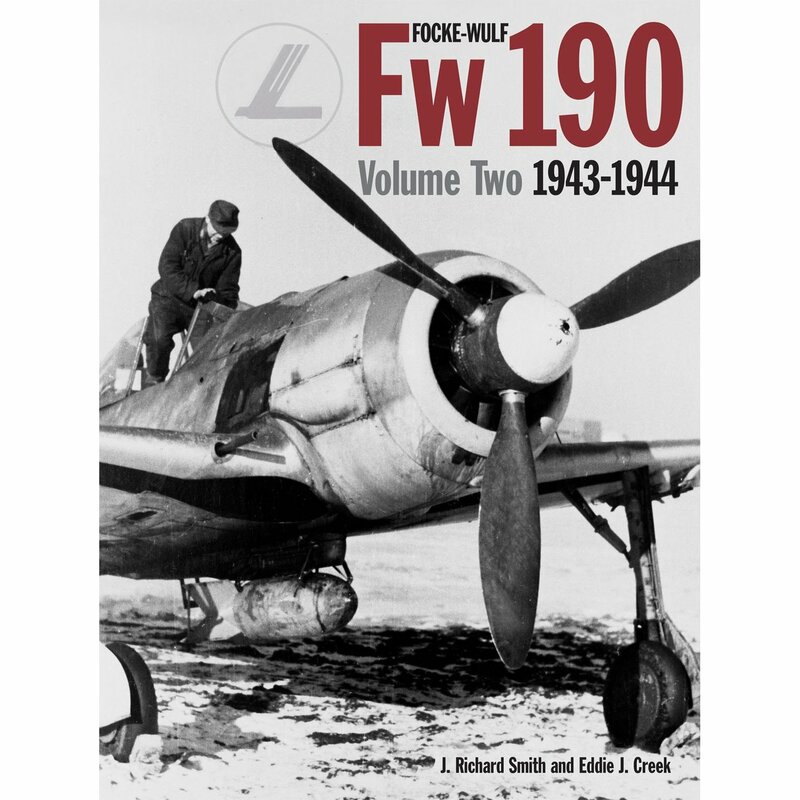 The other person who was also very helpful at this time was Heinz J. Nowarra who was also one of the early leaders of German aviation publishing.
" I guess you might perhaps be best known in the pre-internet era for your monographs in the Monogram Close Up series. 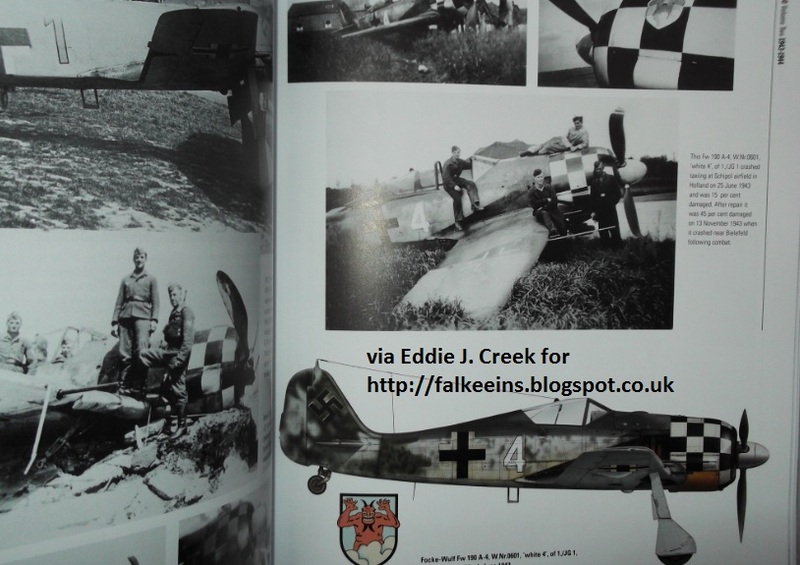 Then there was " Jet Planes .." which was the 'holy grail' of Luftwaffe books when I was a teenager. How did this work come about and how do you look back on it now? " 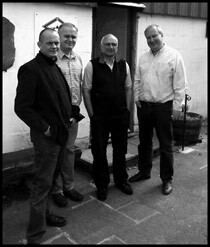 Richard Smith and I carried on co-operating and produced various works including for Profile publications and others. My research was now mainly carried out in Germany where I met many veteran pilots and other enthusiasts and was lucky to obtain many photos and first hand stories. I met Adolf Galland in 1968 at the RAF Pathfinder Club in London where I also met many ex Luftwaffe Nightfighter pilots who were present and several of them invited me to visit them when I was in Germany. 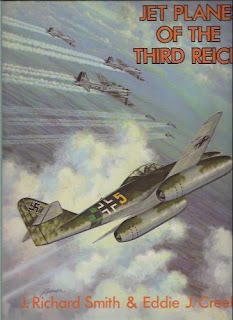 Richard had contacts in the USA especially with Monogram Aviation Publications and it was he who said we could produce a book on 'Jet Planes of the Third Reich', which as you say and I am proud to say was a landmark book in Luftwaffe publishing history.
" ..Is there any one piece of information or fact that you uncovered in your research that stands out especially ? 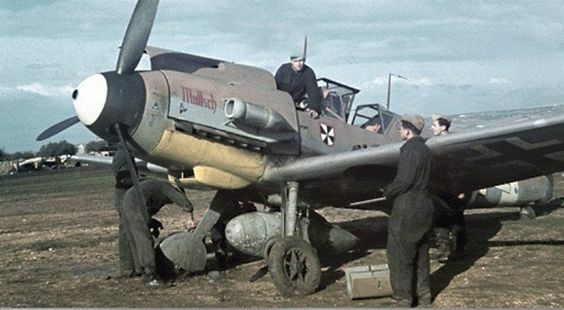 Do you have a 'proudest' moment and/or 'most frustrating' moment during the pre-internet years as a writer/researcher on the Luftwaffe? " The main thing that stands out for me took place during the research into the first book published by Chevron Publishing, 'JV 44' where I discovered much to my surprise, that a great uncle of mine, Rudolf Nielinger flew with the unit. This led to me tracking him down. He of course gave me access to his photos and logbooks. Probably the most frustrating thing that happened to me was the Monogram Dornier 335 book which has my name on the cover but I really had nothing to do with it. 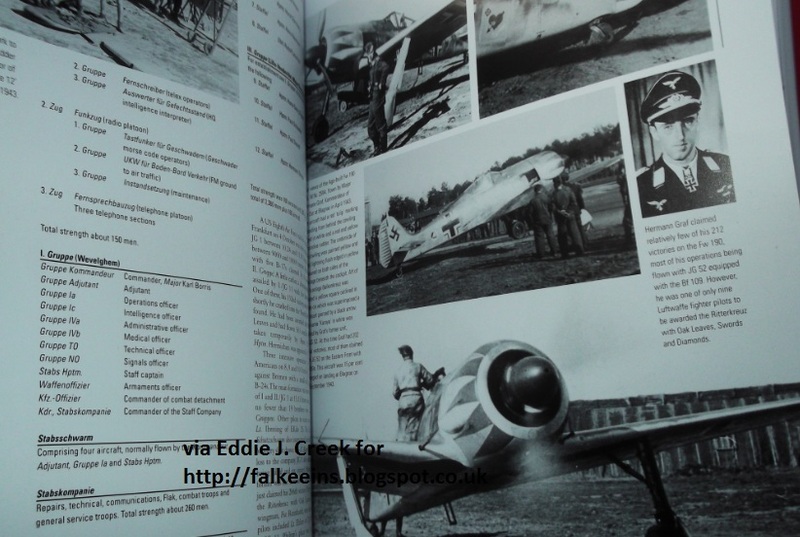 I'm sure you once told me that you don't read Luftwaffe books? Surely you must have an enormous library? Yes I have a large library of books and photographs as well as a large number of documents. I still have a loft full of old Flying Revue and Air pictorial magazines as well as Aeromodeller magazines dating back as far as 1941.
" 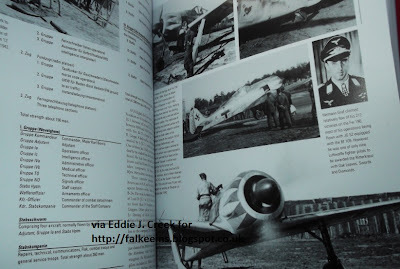 ..Thanks for your time Eddie, any final comments for bibliophiles reading the Luftwaffe blog ?" 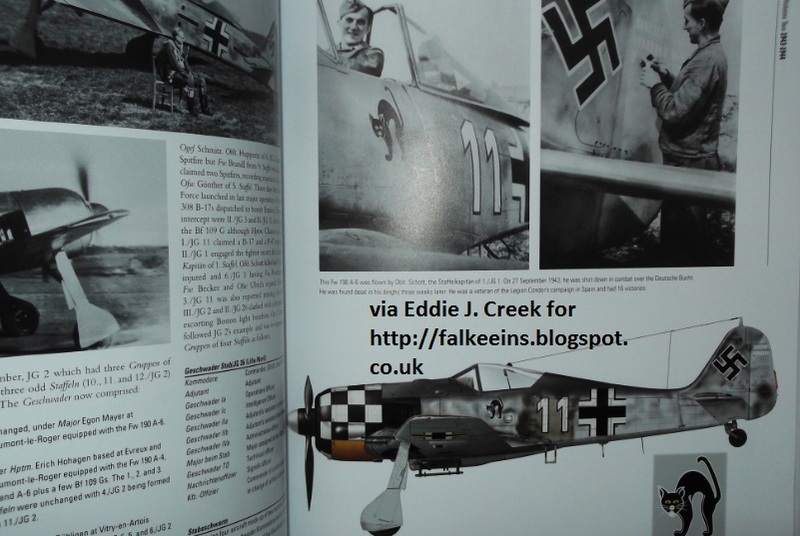 Can I just wrap this up by giving you some information on the Fw 190 book project. I've sent you a digital copy of a brochure I produced and had printed in the USA. I handed out a load of them at the IPMS Convention in Orlando in August. 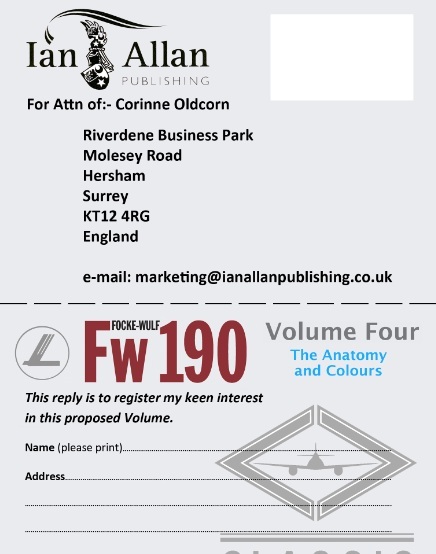 It is meant to give Ian Allan an indication as to how much interest there is in a Volume 4. 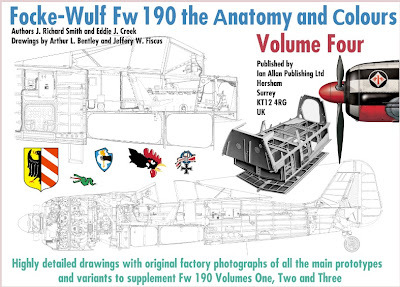 The reason is that none of the first three volumes contain any scale drawings as we felt there is not enough room but we felt we could do the aircraft much more credence by producing a separate fourth volume containing a complete range of line drawings of all the variants plus more photos and a complete section on camouflage and markings etc. Anyway I've sent you a digital copy of the brochure plus a sample of the kind of drawings that will go in to this final volume. If possible just get any of your readers to contact Ian Allan at marketing@ianallanpublishing.co.uk and simply say they are interested in Volume 4! That would be great !